Archives of Eaton Bray News for November 2010. This article was published in November 2010. Please see Latest News for more recent information. The next Parish Council meeting will be on Monday 6th December 2010, 7.30pm, in the Coffee Tavern. Police and Neighbourhood Watch would like to make people aware of the following report on BBC's “Watchdog” programme featured on 4 November 2010 about the following survey that is soon to be sent to over 1 million homes. N-Power, Unilever and Talk Talk are among the many companies sponsoring a survey that is to be sent out by TNT. They request you fill in a questionnaire detailing your personal information and to leave it on your doorstep in an unsealed paper bag for collection the following day. The questionnaire is five pages long and contains one hundred and eighty six questions about your personal circumstances. "These surveys usually require people to provide a large amount of personal information - ranging from whether they have any outstanding medical conditions, to details of their household income. Anyone approached to fill in one of these surveys should think twice before leaving information like this on their doorstep. They should be aware that anyone could potentially pick it up, opening the way to identity theft. People completing these forms should also understand who will have access to their information and what it will be used for." More advice and information is available from the Watchdog website. The 10 week Life Drawing course which began on 16th September, is going really well! The 'students' are very much a mix of all ages and abilities and are enjoying the relaxed and positive learning environment the class provides. The class currently runs every Thursday evening from 7:00 p.m. till 9:00 p.m. and there is tea, coffee and buscuits made available at breaktime giving everyone time to chat in between the drawing activities. There are plans for another course to run in the early part of next year, so if you are interested in joining us - please don't hesitate to contact me, the tutor on 07976 647885 or via my website www.cgallagherart.co.uk. With this year's Annual Appeal now complete we would like to publicly thank the many local people and organisations who believed in The Salvation Army by supporting our Annual Appeal to raise funds for our social services work across the country. We also give a special thanks to our volunteer collectors and all those who gave their time so willingly to our fundraising appeal. In this area we raised £2318.79 for the Annual Appeal and we are extremely grateful for everyone's generosity. Thank you for putting your belief into action by supporting our 'Believe In People' Annual Appeal. Money raised directly supports The Salvation Army's work across all ages and backgrounds, as one of the largest providers of social services in the UK. The Salvation Army believes God values every single person, and so we have always sought to help the whole person - body, mind and spirit. Every day officers, staff and volunteers all over Britain are working with the most vulnerable members of our community, befriending them, supporting them and believing in them. If you missed our collectors and want to make a donation, you can do so through our website: www. salvationarmy.org.uk/annualappeal. Our Cafe Community in October was a great success at the new time of 11-00am until 1-00pm and the Light Bites Menu was very popular. We invite you to join us, relax, meet with friends old and new, enjoy coffee and biscuits or a jacket potato or a B.L.T. for a light lunch if you prefer. Any donations from our November Cafe Community will be shared between Dementia UK, a Charity whose nurses, called Admiral Nurses, provide specialist support for any carer or sufferer of Dementia, and our Chapel Maintenance Fund. There will also be a CRAFT STALL in our Chapel on Saturday 13th November and Saturday 11th December from 10-30am until 1-00pm with lots of excellent gifts for Christmas. An opportunity to shop locally, without the crowds and purchase those special Handmade gifts that seem so much more personal, with of course a welcome coffee or light bite at the end. St Mary's Eaton Bray are delighted to announce that they have a new Vicar. 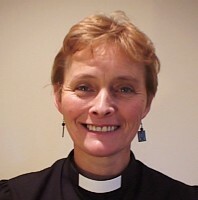 The Reverend Coralie McCluskey is presently Team Vicar in the Welwyn Team Ministry and, until recently, was also Acting Team Rector. Coralie is married to Ralph and has four grown-up children. This is a new fundraising venture for St Mary's this year, which hasn't required anyone to take off their clothes. 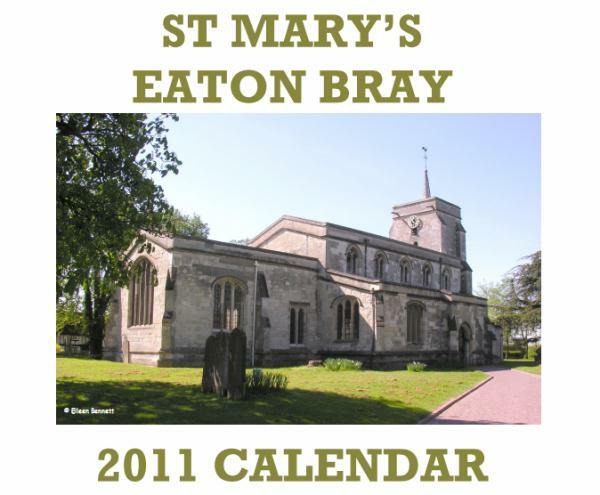 Instead the church has produced a beautiful calendar featuring the church's architecture, people and events. Priced at just £7.50 this is a lovely gift for friends and family who live in Eaton Bray or Edlesborough, or have done so in the past. For more information contact Gordon Gray. Central Bedfordshire Council has recently announced that funding to Bedfordshire Music is to be cut to ZERO from April 2012. More details at Campaign for Bedfordshire Music and in the letter below from Catherine Rose. This would be a sizeable chunk of the Bedfordshire Music budget being cut and would mean either increases in tuition costs or presumably the loss of some groups or music centres. The good news is that none of this is set in stone yet, so you can do your part by writing to your local MP to let them know how important the Bedfordshire Music service is. If you've ever benefited from using the Bedfordshire Music service (through its ensembles, Saturday morning music centre, music lessons, instrument provision, etc), or know someone that has, then please write to your local MP and help raise the profile of the Campaign for Bedfordshire Music. If you are thinking of writing a letter in protest at the 100% cut in cash funding to the Bedfordshire Music Service planned for April 2012, PLEASE CAN YOU DO SO BEFORE 12TH NOVEMBER? I've just realised that the Council is currently reviewing the music service and will have finished this process by 15th November, so we need to get their attention before then. Anyone needing more information or doesn't know what I'm talking about, please visit http://michaelerose.moonfruit.com/#/campaign/4545173370. PLEASE SEND THIS ON to anyone you sent information on to before. I'm particularly keen to get this to PARENTS, STUDENTS AND TEACHERS but I do not have individual emails so please keep it going viral! The website has had 1337 visitors since it went live on Friday lunchtime - keep up the energy! Update: There are further comments on FBYM and Facebook. You are viewing the November 2010 archive.